Sorry for the slack reports, my work pc has been giving me hassles. The weekend saw some good surfing conditions, but the dive was a little stirred up. Some of the guys braved the conditions, and a couple fish did come out. No great shakes but a cuta is a cuta I suppose. At the moment there is still a nice little swell running, the east has put a bump on the sea so surfing might not be on in the morning. The vis is not looking all that bad and will be good a bugg dive at worste. Tomorrow has some light wests pushing through to Wednesday, the swell looks to increase and the surf should pump!! Lets keep and eye on it. it looks similar to a Geelbeck but with out the Geel!! 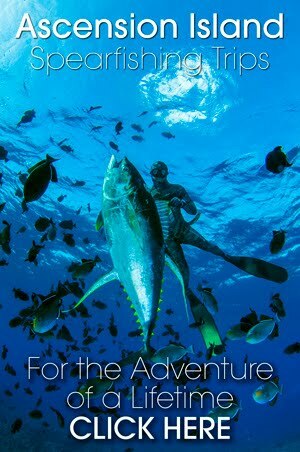 Autumn Spearfishing can be bleak, the conditions are epic, but alas not too many game fish around. I have been out the water and did not dive this morning because of a sinus problem that has been hassling me. A mate Mike got 2 kob in the shallows this morning ... not that bleak!! But he said it was dead quiet other wise. Anyway conditions should hold for a day or so and maybe a late bus cuta will swim past!! You have to love long weekends!! Rob enjoyed his coming right with a lovely Iggie, something to be proud of especially coming out of our local waters. I will be sure to catch up with him and get the low down on the how it all went down...... well done Robo!! I went away with Willy and Glen to Mabibi, we had a fabulous time. The fish were a little quiet but we still managed a few good fish. The surf was firing and on Saturday it took us 45 minutes to get to back line ...... we should have rather just gone surfing!!! I heard some guys got into day and shot some snoek. The water was a bit iffy but if they got fish it could not have been that bad!! Saturday saw some good waves on the coast, we had some great round lefts off a small point. Barrels were had had by all and there many smiles all round. We topped it off with some pancakes ...almost as good as the barrels!! I was hoping to get in this morning but it was still all over the show. There is loads of sand, but the banks are still set up for the north swell and the south swell is just closing hard on the odd shaped banks. There are a number of southerlies due so we should see a good shift in the banks over the next week. ..with a little luck the east wont blow too hard and we will get some waves tomorrow. Well the west has hit and so has the swell from the tropical storm south of Madagascar. With it all has come clean water, can you believe it!! The last time we had swell the water was also clean!! The forecast shows that there will be a small window of opportunity tomorrow morning and Saturday might be good for a surf. Although the swell does not turn south till Sunday nite so it might be Monday before the surf cooks. On the dive front I am not sure when we will get out, well not with the swell being biggish. Anyway I was reading the report from last year today and how similar the conditions have been over the last few days. Some snoek, the odd cuta and the small grunter shoals. P.S - did you check the Cyclone and Tropical Storm tracking links I put up?? They are in the right hand menu bar. 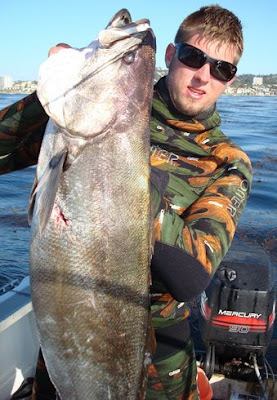 There is a mile stone in a spearfisherman's life and thats when he gets a Cuta. Ok I suppose for the guys in the Med its a gropper or black tail. But on our coast it is definitely a Cuta. Some guys go months with out a cuta, I know for some it was years. For myself it was acouple years, I started young and had no one to show me the ropes, I fumbled along trying to learn from mates who were suffering the same fate. I remeber being up at Cape Vidal and a boat with some spearo's came in. They must have had at least 5-8 cuta each some were in the 20kg mark. I thought these guys were hero's. It must have been 5years after that when I finally got up to Leven pnt and got some for myself. Anyway Scotty has been chasing Cuta around for the last few months, and just has not come right. We decided to hit a quick bug dive and wammo he gets a cuta ..... in fact I dont think he even got buggs to day? Just fish on the brain!! P.S a mate dropped a monster cuta off Umhlanga last night, he fought it for a while but it tore off. Bummer it got away ...but good to here some big fish are still around. Well it looks like the poo is going to hit the fan again ..... the swell forcast is calling 3m swells?? The south west should hit late tomorrow and blow till friday with another south over the weekend. After a fairly good weekend weather wise .... thats excluding the fact that the water was green and cold!! Well the surf was at least on the good side, we surfed some great lefts on Saterday and Sunday. But now there is some serious weather coming. There is a cyclone in the channel and a strong cold front down south. These two are going to smash into each other and at this stage it looks like the cold front will smash the cyclone. A mate sent me a new link that tracks cyclones ...really cool! It will be interesting to see if this sorts the sea out or if it puts us on dry land for another week. Once again the sea is pea green and I was just not amped to get in .....call me spoilt, but groveling in 3m vis is not my idea of fun. I was driving off to work this morning and realised that the 'summer run' was probably over! Although we might have some good days left before the quiet period in late April and May, the bumper cuta filled mornings are probably over til next year. I can remember one year a mate dropping everything the one week in February when it was on. His comment was this happens only once in the year and he was going to make the most of it. I on the other hand did not make the most of the good run of water and fish we had a month ago. Some how I just missed it and there was always the hope that we would get some more days. This just was not to be, some rain and then 2 weeks of swell blew that one. Now we are going to have to jump on every day that comes our way, there will still be good fish ...just not guaranteed like in early Feb.
Next week Tuesday shows a strong south .....maybe it will turn things around?? P.S - dont forget the Salty Divers Club meet tomorrow nite!!! Well the sea looks good this morn ...not sure how clean it is but the conditions are great. The might have been a small wave as well, but there is not too much swell to talk about. The forecast shows that there will be no wests for another week!! that does not ring well for the sea. Thats unless we get some blue water from the east winds ..... not common but very good when it does happen. Other than that not much else is happening, the Salty Divers are meeting in Ballito on Friday nite ......drop me a mail if you are keen to check it out. The East pumped yesterday totally screwing up the sea, there is a small west coming but a large high pressure system is going to push it away down south. This means that is very little chance of things coming right. ...bummer!!! Well tradition was upheld this weekend as the bugg season opened with very kuk water. A couple brave warriors dared the deep muck and groveled a couple critters. The west blew and the sea made a huge turn around and now you can at least see the end of your gun ....but that's about it. I went for a dive this morning and it was miff, I scrounged a couple buggs, but to be honest I should have gone surfing .... it actually was cooking! !